Sarantos Releases A New Song About Being Comfortable With Silence - "The Silence Doesn't Bother Me"
Silence is all around, sometimes it's present despite being in a crowded room. The song is about being comfortable in the silence of your art not being well-received. His music will play regardless of what they say! 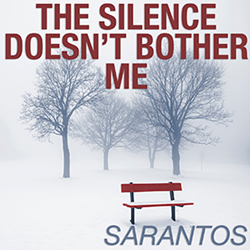 Sarantos Releases A New Song About Being Comfortable With Silence - "The Silence Doesn't Bother Me." Silence is all around. Sometimes it's present despite being in a crowded room. Sometimes it is one's only companion. Some are scared of silence. Some relish it. Some cannot function in silence. Some thrive on it. Silence affects us all differently. Sarantos newest song is about being comfortable in the silence despite the storm thundering loudly outside. The song is also about being comfortable in the silence of your art not being well-received. Regardless of whether it's a movie, song, book or painting, the artist is in a very real sense naked and exposes all personal vulnerabilities when their art is released into the public light. No artist ever creates something out of nothing without pouring their heart and soul into it, viewing it from every angle, and ultimately thinking it is a masterpiece. Critics and fans might not always agree however but that doesn't mean everyone is not entitled to their opinion either. There is freedom of expression in the world today and that's ok. Artists need to overcome their fears and grow comfortable with the silence if and when it comes. At one point, there will surely be silence whether it's failed art today or a failure to recapture the glories and heights of the past. Maybe there is silence because a lover or a fan does not want you anymore. "This is a song about silence," says Sarantos. "My initial intention when I wrote the lyrics was to think about my 1st live performance. I was of course very nervous. The song taps into that but then also reaffirms that eventually he decides that even if the crowd hates him and doesn't clap or cheer, the silence won't bother him. He will finally be free because he no longer cares what they think. The rules are gone as he finally lets his true colors show. He has been waiting for this moment all his life. His music will play regardless of what they say! Of course there are several hidden meanings to the lyrics as they can also be applied to any art form and even interpreted as a once famous artist who no longer can get back on top and is left alone in silence." Sarantos won the Akademia LA Music Awards in 2015 for Best Song (What If I Never See You Again), Best Rock Song (Easy To Believe), Best Rock Ballad (The Veteran), Best Rock Music Video (We Accept The Love We Think We Deserve), Best Singer/Songwriter Song (A Mission Of Heart, I Sing), Best Pop Song (I Sing) & Best Pop Rock Album (Not Where I Wanna Be). Sarantos has won twelve Beat 100 song & music video awards in 2015 and 2014. Sarantos was nominated for the International Music & Entertainments Awards in 2015 for “Rock Song of the Year” and in 2014 for “Rock Song of the Year” and “Pop Album of the Year.” In 2014, he was also nominated for the Hollywood Songwriting Awards for Best Unsigned Song (Are You Sure You Can Last). Even without a label or radio promoters, Sarantos song “What If I Never See You Again” has been in the top 200 on the majors list in the US for radio airplay according to the Digital Radio Tracker Top 200 charts. On the independent charts, Sarantos is still in the top 10. He's been on both these lists since early April. 33% of any music-related sales profits from this song are going straight to the National Ovarian Cancer Coalition. Their mission is to save lives by fighting tirelessly to prevent and cure ovarian cancer, and to improve the quality of life for survivors. *Because Sarantos wants his music shared throughout the world, fans can always find all of his songs, lyric sheets, videos and books on his website for free. He openly gives everyone the right to share his song mp3s for free with anyone they want via email or any of the social media platforms.